History is not just the past. It is a potent weapon for various political agendas in the present. It can be clearly seen in the use of history in rise of Hindu-Muslim rightwing in India. As far as presently dominant Hindu national politics is concerned, this abuse of history can be seen in the type and period of History used. When Meenaxipuram, conversions of dalits to Islam took place in 1981, the message taken up was that of Islam’s spreading in India as a ‘threat’. With the rise of Ram Temple movement, the indication was towards the Muslim kings’ destroying Hindu temples and insulting Hindu religion. The Babri demolition and consequent violence had the underlying propaganda of temple destructions by Muslim kings. At the same time a slogan came up ‘Muslaman ka do hi sthan: Kabristhan ya Pakistan (only two places for Muslims: Pakistan or graveyard), asserting that India is meant only for Hindus. As we move a bit more towards Gujarat carnage 2002 we see the projection of ‘terrorism’ and Muslims on one hand and the projection of Miyan Musharraf as the symbol of Indian Muslims. In Maharashtra Shivaji was projected in various ways to show the tyranny of Muslim kings. Currently serials like Bharat ka mahan Saput Rana Pratap, and Jodha Akbar also give the same message. Lately the present history, history of Modern India is under the chopping block of communal forces. On one hand the projection of Sardar Patel, with emphasis on his being anti-Nehru and the other various conjectures of this period are being dished out. It is being asserted that Congress ‘facilitated Partition’ (Narendra Modi while talking in Kheda in Gujarat). This is a very motivated statement. As a matter of fact the two major leaders who were handling the negotiations at that time, on behalf of Congress, were Pundit Jawaharlal Nehru and Sardar Patel. Mr. Jaswant Singh’s book on Jinnah, taking one sided view blames Nehru-Patel for partition. It was banned by Modi in Gujarat, as he won’t brook any criticism of Sardar Patel. Here with a forked tongue, two things are being said at the same time, Patel eulogized for his contribution and Congress being blamed for partition, unmindful of the fact that it was Nehru-Patel duo, which was acting together on the issue of India’s partition. That way the tragedy of India’s partition is like a big canvass, and most of the commentators look at the part of the canvass which suits their politics and put all the focus on that. This focusing on one part of canvass, selective historiography, is due to the motives and political understanding of these commentators. Seeing the whole process will tell us a different tale. The partition tragedy cannot be located just in the final phase when the negotiations between British rulers, Muslim League and Congress were going on. Partition process was the culmination of a long process, which began with the aftermath of anti-British revolution in 1857. The first factor in the process of division was the British decision to implement the policy of ‘Divide and rule”, thereby to introduce communal historiography. The second major factor was the persistence of feudal classes despite the beginning of industrialization and modern education. These feudal elements, the declining classes, felt threatened by the rising, nascent democratic nationalism, as represented in the formation of various organizations of industrialists, workers and educated classes and the formation of Indian National Congress. These declining classes, Hindus and Muslims landlord-kings, were together in the beginning. One major step in the direction to break them along religious lines was Lord Elphinstone’s encouragement to Muslim landlords, Nawabs, and to recognize them as representatives of Muslims. This led to formation of Muslim League in 1906. In tandem with this Punjab Hindu Sabha came up in 1909, Hindu Mahasabha in 1915 and RSS in 1925. These communal organizations started getting support from section of educated elite apart from some upper castes and traditional traders. These communal organizations were against democratic nationalism and articulated religious nationalism. The third and major theoretical expression for partition comes from the ideologue of Hindu Mahsasabha, Vinayak Damodar Savarkar, who said that there are two nations in the country, the Hindu nation and Muslim nation. The separate country for Muslims was articulated by Chowdhary Rahmat Ali in 1930, Pakistan. This got politically consolidated in 1940 with Jinnah’s demand for a separate country in the form of Pakistan (West and East). Fourth important step in the direction was the fact that the demand of Pakistan suited the designs of British colonialist’s long term plan to have a base in South Asia. As Communism, Soviet block was progressing and inspiring leaders of many national movements, like China Vietnam in particular, colonialists wanted to counter this by having a political base in South Asia. In India, Soviet Union inspired the communist and socialist movement. People of the caliber of Nehru, Jaya Prakash Narayan and others were with Congress Socialist Party, an in-house organization within Congress. Seeing the influence of socialist ideology on the major leaders of national movement, the colonialists and imperialists were keen that India should not remain united. There keenness of partition encouraged the demand of Pakistan. Congress at this point of time found itself in a trap. On one side the stalwarts of National movement, Gandhi and Mualana Azad were opposed to the partition in the deeper political way. Nehru and Patel; experienced the blockades put up by the Muslim League in interim government. The choice before this duo was either to go on with a Cripps mission plan, which gave very little power to the center, or to go for partition and have a strong Center in India. The calculation of Nehru was that without the centralized economy; country cannot progress. The Bombay plan, economic blueprint of industrialists, wanted the state to provide for heavy industries, as industrialists realized that they are not capable for setting up large industries. This was parallel to the vision of Nehru, who envisaged land reforms and industrialization to take India forward. Sardar Patel had the vision of the strong center so he was also not for the loose federation of states as provisioned by Cripps mission. To blame Congress of facilitating India’s partition is nowhere close to the truth. But the way History, even the modern Indian history, is being bulldozed for the political convenience, and the eagerness to grab power come what may, sacrificing the truth, is not a big deal for the communal politicians. Sir are you trying to attract eye-balls by mentioning Modi in the headline? You clearly haven't succeeded much as I seem to be the first commentator. Why should so much burden be put on Modi who is just one of the many not very educated politicians that are prospering in current times? Isn't historiography always biased? Listen to any communist historian twist himself into knots while explaining Aurangzeb. Or re-read your article perhaps. Starting with Modi (a cipher as far as understanding of history is concerned) you have gone all the way back barely concealing your visceral hatred for V D Savarkar by gratuitously inserting a photograph. And what is your final analysis? The problem emanates from the brits (always convenient) and the Hindus. Savarkar was an athiest but one wouldn't know that reading your piece. 'Puniyani on rampage' could very well be the title except it won't attract anyone as no one knows who Puniyani is. Thanks for leaving your comment. Though we do have a number of readers, they rarely leave any comments - probably because ours is not a 'popular' website. 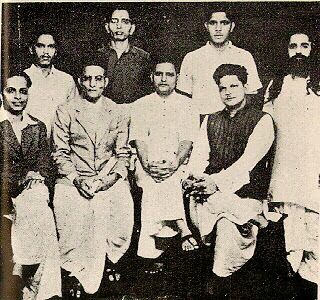 Was Veer Savarkar really veer?